TORONTO--(Marketwire - Jan 26, 2012) - Foodies flock to downtown Toronto every winter for Winterlicious, an annual culinary event celebrating the finest in food with events across the city. Guests at the Toronto Marriott Downtown Eaton Centre Hotel, a Toronto luxury hotel, will be within walking distance of top restaurants offering special pre-fixe menus as part of the annual event. For prices as low as $15 for lunch and $25 for dinner, diners will have the chance to enjoy a starter, entree and dessert at Toronto's top tables. Celebrating its 10th year, Winterlicious makes some of the city's most coveted restaurants accessible, including Trios Bistro, located within our hotel in Toronto. Led by Marriott International's 2010 Chef of the Year, Morgan Wilson, Trios Bistro offers a stylish, romantic setting with a stunning view of the historic Church of the Holy Trinity. "We're thrilled to be participating in Winterlicious for the 4th year," said Executive Chef Wilson. "I've created menus that showcase classic Canadian favorites and use only the freshest ingredients available." Wilson, who placed 8th among non-European chefs in the famed Bocuse d'Or culinary competition in 2005, describes his cooking style as "continually evolving," and that great food will always combine "top quality products with flawless technique." Wilson has used that mantra to create delicious dishes for this year's Winterlicious menus. In the past, he has created everything from an Alsatian onion tart and Niagara apple and cranberry crumble for lunch to a Merlot-braised veal shank and Quebec maple-roasted butternut squash soup for dinner. Winterlicious runs from January 27th through February 9, 2012, and reservations are strongly recommended for both lunch and dinner. Lunch prices range from $15 to $25 per person, with dinner prices still a steal at $25 to $45 per person; taxes and gratuity and are not included. To make a reservation at Trios Bistro, call 416-204-9018. To make a reservation for hotel suites in downtown Toronto or other luxury rooms at the Toronto Marriott Downtown Eaton Centre Hotel, please call 1-800-905-0667. 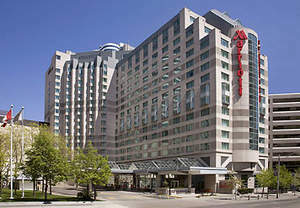 The Toronto Marriott Downtown Eaton Centre offers guests an exciting, productive and relaxing experience, all in the heart of downtown Toronto. Our upscale hotel features luxurious and stylish accommodations, with our Wired-for-Business Package, including high-speed Internet access and long-distance calls, plug-in panels and our Revive bedding package, with down comforters, designer duvets and plush featherbeds. Suites have 50% more space than average downtown Toronto hotel rooms, and our concierge-level rooms offer upgraded amenities. Start your day with a workout in our health club, or enjoy a relaxing dip in our 18th floor pool overlooking the city. Our centrally located suites put you within walking distance of the Rogers Centre, CN Tower, University of Toronto, Dundas Square and world-class shopping at the Eaton Centre, directly connected to our hotel via an indoor walkway. Gather for fine dining at our Trios Bistro, featuring the talents of Marriott International's 2010 Chef of the Year Morgan Wilson, with an elegant cocktail bar and a view overlooking historic Trinity Square. Our distinctive downtown hotel features more than more than 18,000 sq ft of event space, perfect for weddings, corporate functions, board meetings and more. Guests at the Toronto Marriott Downtown Eaton Centre Hotel, a Toronto luxury hotel, will be within walking distance of top restaurants offering special pre-fixe menus as part of the annual event.